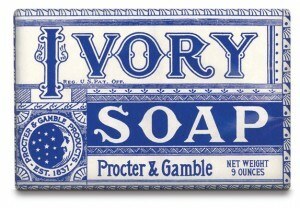 Ivory Soap, although today only producing 1% of the revenues for Procter and Gamble, is one of the company’s oldest and among its most iconic brands. The original white bar soap was first sold in 1879! Today, there is a series of soaps, detergents, body washes, and related products that are identified as Ivory Soap. The son of the founder, Thomas N. Gamble (a chemist) concluded that prolonging the mixing time for this formula of soap would produce a bar with extra air incorporated into it and, therefore, it would float! Its basic formula of sodium tallowate, magnesium sulfate and sodium chloride, among other ingredients, produced a soap that was “99 and 44/100 percent pure.” That slogan and the soap’s ability to float set this soap apart from all the others at the time and into the 21st century. Produced in a plant in St. Bernard’s, Ohio, this soap product is available worldwide. During the early 50s, many families used the Ivory Snow detergent to make “snow” for holiday displays; recipes on the P&G company pages provided instructions for the correct proportions and methods for making “snow.” There have been many “Ivory” soap babies used to advertise this product, from the very first painting of a cherubic baby in 1886, through Brooke Shields appearing in commercials as a smiling infant in a bathtub. In 1992, the addition of glycerin to the bars made them “non float-able” and diminished the drying effect of the bars on human skin. Nevertheless, Ivory is still preferred by holistic consumers for its ability to kill bacteria with no harmful dyes or perfumes masking its purpose. Today the Ivory soap brand family includes bar soaps (pure white and with colors), liquid hand soap, body wash, body and hair (2 in 1) washes, dish detergent, and laundry soap (Ivory Snow). Many new mothers still prefer to use Ivory Snow for baby clothes, simply because of the gentleness of the ingredients and absence of harsh chemicals in the product. This is a robust function along with the people need certainly to definitely perform hard-on their tactics in order to grab the awards.